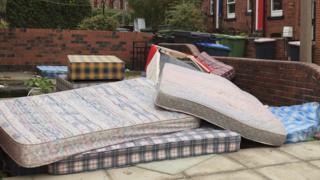 Fly-tippers could be forced to pick up other people's litter as part of their community service. Those convicted could be made to carry out the punishment in addition to being fined or jailed. Environment Secretary Andrea Leadsom said it would help communities in England blighted by fly-tipping and help cut costs for councils. The measures are being announced as part of the government's new litter strategy. Councils reported 936,090 cases of fly-tipping in 2015-16, costing almost £50m to clear up. It was the third year in a row that incidents had risen, with fly-tipping reported almost 107 times an hour across England. How do you stop fly-tipping? Mrs Leadsom said: "Countless volunteers take time out of their lives to clean up the mess made by irresponsible litter louts and fly-tippers. "But clearing up after fly-tipping not only affects local communities, it also costs the public purse millions. "The government now wants to see more of those committing crimes like this taking responsibility for cleaning up the community by picking up litter and illegally dumped waste themselves." The national strategy on litter, expected to be published on Monday, is intended to "clean up the nation's streets, roadsides and grass verges", the Department for Environment and Rural Affairs said.